Cherries are synonymous with Door County. As you travel up and down and across the Door Peninsula you will be hard pressed not to pass a cherry tree orchard. 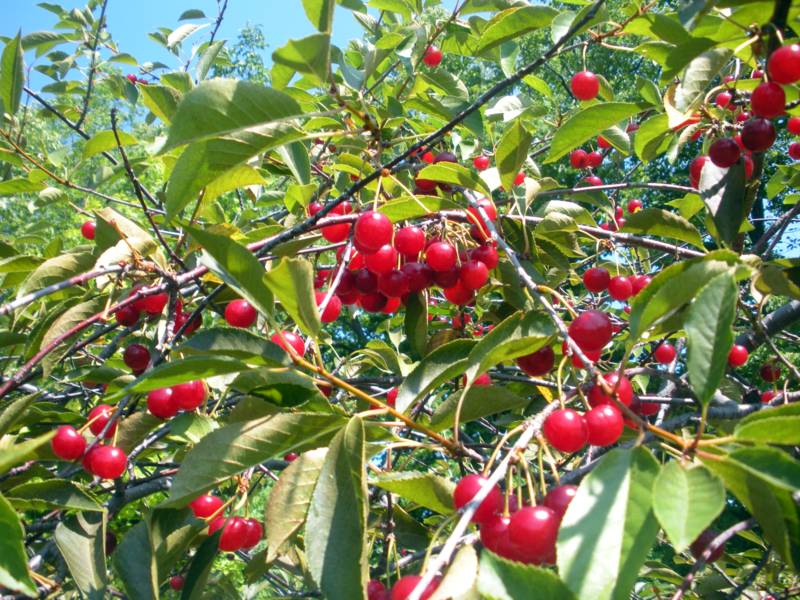 In late July and early August cherries are ripe and ready to be harvested. Cherry tree branches are dotted red with ripe fruit and even look a little like Christmas tree’s decorated with bright, little ruby red ornaments. 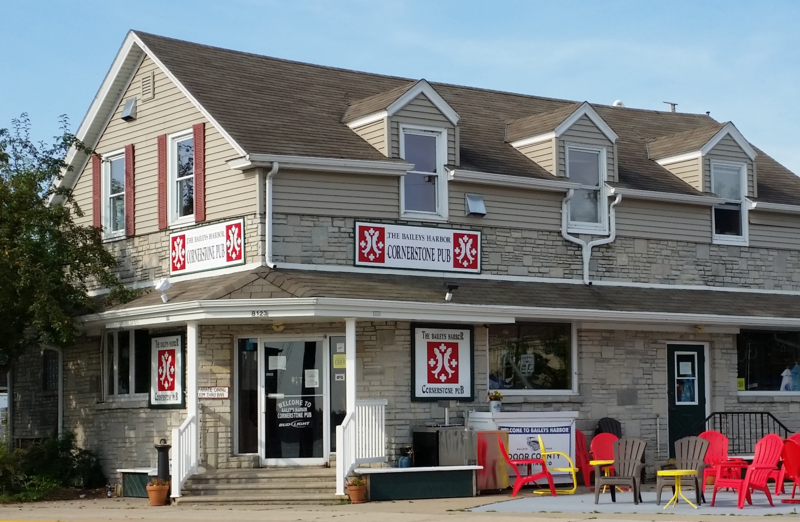 In August of 2014, my family and I stopped in for lunch at the Cornerstone Pub in Baileys Harbor and started talking to our server. We learned that working at the Cornerstone was his part time job and he was a local farmer, and his wife was a dairy farmer. As we talked he shared a few stories about the different produce he was growing, he leaned in a little closer as to tell us a secret, there was a wonderful baker in the area that made the best cherry pies and the pub had one fresh baked pie left, did we want it? We bought the pie, stopped by the YumYum Tree for a couple scoops of vanilla ice cream to go, and brought the pie and the ice cream back to the condo for later. The pie was wonderful and we enjoyed a piece after sunset for the next three days. Fast forward to 2015, this is where it gets interesting. 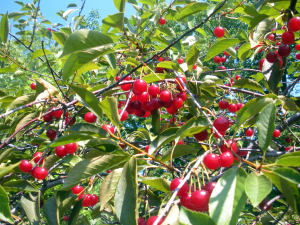 We decided to head to the Falcon Orchard on Route 42 between Sisters Bay and Ellison Bay to go cherry picking. In 2014 we picked about 10 pounds of cherries, for about eight dollars, but we were later in the season this year and the picking was done. We decided to head north about a quarter mile on 42 to Seaquist Orchard. After playing in the rope maze, we went inside to the baking department and started reminiscing about the cherry pie we bought at the Cornerstone pub the year before. We decided not to buy a pie at Seaquist, but to head back to the pub and see if we could get a cherry pie there. When got to the Cornerstone we learned that the baker had moved on and started her own business and that she was actually on the Food Network show Chopped. Unfortunately, no one could remember her name or the business she opened, just that she was chopped from the show and her business was closed. I asked the waitress if she could recommend another place to get a pie. She suggested Sweetie Pies in Fish Creek, but by the time we got there they were closed. Someone we bumped into in the Settlement Courtyard shopping area there said they remembered the Grandmas’ Swedish Bakery in the Rowleys Bay Resort made a good pie, so we jumped back in the car and were off to the other side of the Peninsula to Rowleys Bay. We got there in about 20 minutes and found the resort and the bakery, unfortunately they had not made pies in several years. They still have incredible cinnamon rolls and coffee cake, which are very popular. We walked around the resort for a bit and decided to drive back to Seaquist to see if they were still open. They were, we picked up a fresh cherry pie and headed back Baileys Harbor. It was good cherry pie and now we had a great story to share. All said and done we traveled 60 miles to find the perfect Door County cherry pie. Since then we have purchased several pies including one from Woods Market, Sweetie Pies, The Cherry Pit, and Grandma Tommy’s. All of them good but our first pie from the Cornerstone Pub will always remain our perfect cherry pie. One of the Advantages of staying at Baileys Harbor Yacht Club Resort is catching the wonderful Sunset over Baileys Harbor without having to cross any roads or carrying anything to sit on. All you have to do is walk out to the harbor and grab one of the many accessible chairs or picnic tables. If you have a bay side room it’s even easier, open the sliding glass door and step out onto your patio or deck. 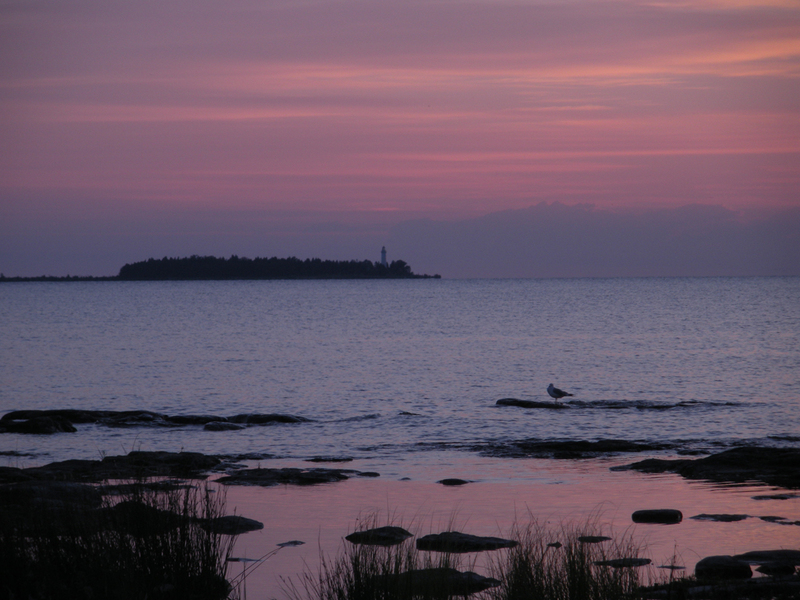 We generally visit it August and that means the sunsets about 7:00 pm, give or take a couple minutes depending on the time you visit. On the nights we don’t go out for dinner we grab one of the resort gas grills around 5:30 pm and eat bout 6:30 pm, giving us enough time to pop some corn (Koepsel’s Farm Market, located on Highway 57, has a good locally grown selection of popping corn if you did not bring any), grab a glass of wine or hot chocolate and head out to the harbor and grab some Adirondack chairs. It’s really relaxing to watch the seagulls and dragon flies hover around and listen to the waves lap on the rocks. Since Baileys Harbor Yacht Club Resort is on the Lake side of the peninsula you are not going to see the sun set into Green Bay. 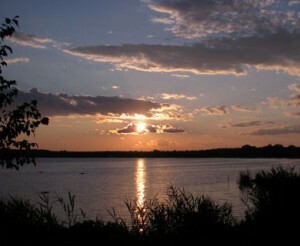 Instead it sets into the wooded town of Baileys Harbor giving off a unique show of light as it sinks into the trees. After the sun sets we hangout for another 10-20 minutes before heading back to the room. We like to watch the sky turn to dark blue and then to purple and finally to black. If you sit quietly long enough there is a chance you will see a bat or two chasing the last dragon flies of the evening. After sunset we head back to the room and throw in a movie and watch the first half before hitting pause and head back out to the harbor to do some star gazing. When the moon is new you will see a great number of stars. The Big and Little Dipper are clear in the night sky as well as Orion and Cassiopeia, constellations that are bit more challenging to see from the Chicago lit sky where we live. The Perseids meteor shower is in August and is one of the years best meteor showers, producing up to 60 meteors per hour at its peak. Other summer meteor showers include Eta Aquarids Meteor Shower in May and the Delta Aquarids Meteor Shower in July. It’s about 6:00 am in early August and from our condo balcony I can see the sky is turning from black to purple and the stars are beginning to fade. I shake my wife and my son and say “come on, it’s time to go if we are going to make the sunrise.” Reluctantly they get up and throw on some jeans and sweatshirts. I grab some granola bars and head to the lobby for a couple cups of coffee to go. We jump into the car and head to the end of ridges road and then take a left on the gravel road and follow it to the end where there is a loop and pull off and park on the west side of the road. There is a small trail head here were we hike through a short overgrown area that open up into a patio of large rocks, shrubs and flowers. 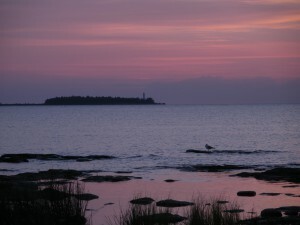 From here Moonlight Bay and the Cana Island Lighthouse start to become visible in the early morning light. There are some nice flat rock on the shore and we unroll a couple towels set out the granola bars and find a place to set the coffee where it won’t spill. It’s now 6:20 am am and the purple sky is changing to blue and the last stars begin to fade away. In the distance I can see a charter fishing boat motoring out to catch their limit of Salmon and an occasional flock of birds flying Southwest. Then it happens, the Lake Michigan waves begin to burn red/white as the rising sun glows through the breaking waves before it rises above the horizon. My wife, son and I sit quietly watching as the top of the sun begins to climb above water line. Waves are breaking on the rock beach every couple seconds and the seagulls can be heard in the distance and in about 90 seconds the sun is up shining radiantly. Before heading back to the condo we explore a couple rock formations, trying not to get wet. After about 20 minutes we gather our belongings and head back to the path that leads us to our car. We will return here later in the week for a longer hike along the rocks but we will ride our bikes next time. We only take the car when we want to make the sunrise. Biking Ridges Road offers several opportunities to pull off to the side and go for hike and explore the rocky water front around Toft Point and Baileys Harbor.. Check out the some history on the area and 2-3 mile hike that you can do from Baileys Harbor Yacht Club Resort. One of the perks about visiting Door County is stopping by the numerous farm market stores that are rich in regional produce, food good and art. Wood Orchard in Egg Harbor is daily stop from the day we arrive and the day we leave and I believe they have the best fresh picked sweet corn in Door County. 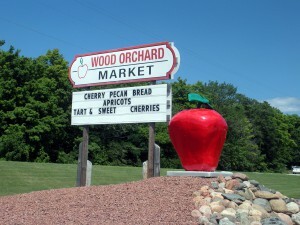 Established in 1955, Wood Orchard Market has been family owned for three generations. 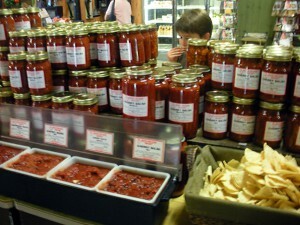 Depending on what season you visit Door County will determine what fruits and vegetables will be available. Spring offers a selection Rhubarb, Asparagus and Morel mushrooms; summer is berries, cherries, peaches and sweet corn season; and fall is pumpkins and gourds. Their onsite bakery produces pies, strudels and breads as well as well as a selection of homemade fudge during the three seasons and you can order their canned jellies, jams and dip mixes all year long. 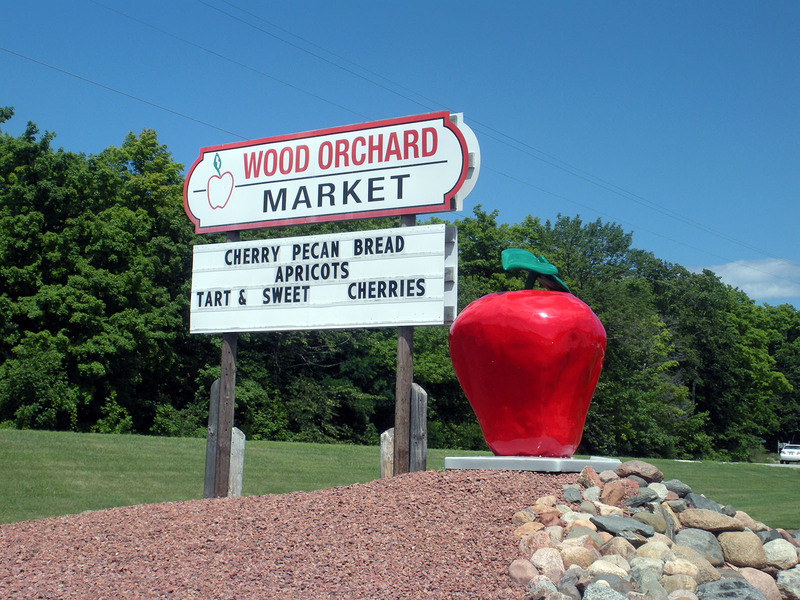 We make a stop at Wood’s each afternoon during our vacation to pick out some sweet corn and then spend another 20 minutes “browsing” their fresh fruit and dips, crackers and mustards, salsa and chips, and fresh baked goods. 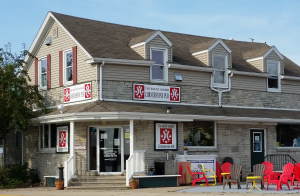 They have a small selection of cheeses, frozen meats, coffee and wine (most produced locally in Door County) that meets the needs of a weeklong vacation. There are also free frozen apple popsicles for the kids in the freezer section. After buying some cherries juice, cherry jam, cherry salsa and corn my son and I head out to the peddle carts to give the misses some time to browse the yart. That is Yard Art, we have several of these metal creations, and our collection includes sunflowers, birds and yard animals. The peddle carts are fun distraction for kids of all ages. There is a small crushed stone track around the big Wood Orchard sign and three or four carts available first come first serve bases. Even if you are not peddling it’s a nice area to sit on a bench, soak up some sun and snack on something for the market. Winter is considered the Quiet Season in Door County for good reason. While some local shops and services do close for the winter season, there are still many wonderful places to discover here. Some of our most loyal guests actually prefer to come during the Quiet Season. You are able to enjoy the relaxed, uncrowded atmosphere and see a whole new side of the Peninsula. Others come specifically for the ice fishing, cross country skiing, and other winter recreational activities. 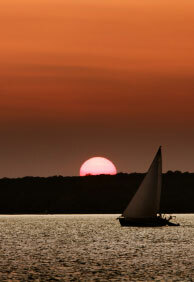 Whether you are looking for cozy or adventurous, we know you will find it here at the Baileys Harbor Yacht Club Resort. The Door County peninsula is home to acres of state parks and nature preserves. The resort is adjacent to both Tofts Point and The Ridges Sanctuary. Meander the wooded trails, perfect for snowshoeing or cross country skiing, take the kids (even the big ones!) sledding, or ride a snowmobile down one of the specially designated trails. The Ridges sponsor guided snowshoe walks in addition to their winter nature walks. 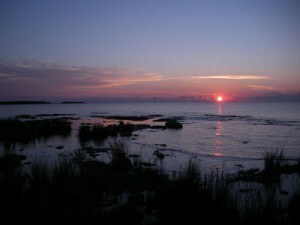 Peninsula State Park is just one of the state parks in Door County that sponsor winter recreation. They offer separate trails for classic cross country, skate skiing, snowmobiling, and snowshoeing. Bring your camera and capture the memories. Look for special events, like the Candlelight Skis that are traditionally scheduled at the state parks during January and February. Enlist one of the local guides to take you ice fishing. Door County Trolley is known for their wonderful tours of Door County all year round. In November, you can hop on a Premier Wine Tour for a “cellar door” tasting tour of four award-winning wineries and a gourmet lunch. That is sure to stave off the winter blahs! From December through March, embrace the season with a Winter Wonderland Trolley Tour & Sleigh Ride, which combines the wine tasting with a sleigh ride and a fireside lunch. If you prefer a horse to the sleigh, we still have an adventure for you. Make an appointment for a weekend ride with Kurtz Corral in Sturgeon Bay. They are open Fridays, Saturdays and Sundays from November through May. See their stable here… and don’t forget a carrot! Door County’s restaurants provide many excellent choices for a magical New Years Eve, but what about New Years Day? A local favorite is the Jacksonport Polar Bear Club. Will you brave the frozen waters of Lake Michigan or stand by with a hot drink and a smile? New Years Day parades are another wonderful tradition and you don’t always have to be on the sidelines! The Fish Creek Winter Games are a family-friendly festival in Clark Park. It features food, music, raffles, and games under a large heated tent. The games are always inventive and guaranteed fun, so check out what they have planned for this year. Most of the action occurs on Saturday, but don’t miss Sunday’s Fruit Loop Fun Run! Prefer to stay in? Watch the snow fall from the comfort of our heated indoor pool and whirlpool. Take advantage of in-room DVD players and plenty of movies to pick from at the Front Desk. While there you can take a board game or play a friendly game of chess. Warm up with a cup of hot tea or cappuccino from our lobby and relax in front of the fireplace. We think you’ll agree that it really doesn’t get much better than this. When you’re ready, our staff at the Front Desk would love to help you with information about dining. It’s our pleasure to help you find the perfect place for breakfast, track down a delicious lunch for your active family, or plan a romantic dinner for two.